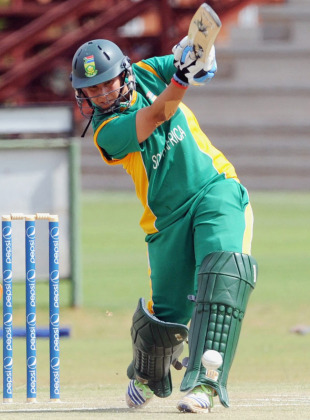 South Africa took the top spot in the ODI leg of the ICC Women's Cricket Challenge, thrashing Netherlands by ten wickets at North-West University N0.2 Ground in Potchefstroom to notch up their fifth consecutive win. Netherlands, who were asked to bat, lost their openers cheaply before a 35-run stand between captain Helmien Rambaldo and Marijn Nijman promised to stabilise the innings. That, however, didn't happen as a collective bowling effort by South Africa, led by offspinner Sunette Loubser who grabbed three wickets, cut through any resistance from the Netherlands batsmen. The progress was painstakingly slow and only one among the last six batsmen reached double-figures. Medium-pacer Marcia Letsaolo and 17-year old legspinner Dane van Niekerk took two wickets each, as Netherlands folded for 109. The South African reply was ruthless, with the openers, Shandre Fritz and Trisha Chetty, dominating the bowlers to finish the game with 32.4 overs to spare. As a result of their win, South Africa move to No.5 from No.7 in the women's ODI rankings. Sri Lanka prevailed over Ireland in a tense encounter at the Witrand Cricket Field in Potchefstroom, winning by two wickets to finish third in the tournament. Ireland opted to bat and their batsmen responded well, led by opener Clare Shillington who top-scored with 78. Her innings included just five fours and involved plenty of running, and her partners supported her well. Isobel Joyce and Jill Whelan were involved with Shillington in stands of 70 and 38 respectively to lay a strong platform. The Sri Lankan bowlers, however, hit back, grabbing two wickets with the score on 146 and striking steadily thereafter to restrict Ireland to 211 for 8. Seamer Chamani Seneviratna and offspinning allrounder Shashikala Siriwardene took two wickets each. Sri Lanka appeared to be in trouble in their reply, reduced to 35 for 3 at one stage, but opener Inoka Galegedara and middle-order batsman Sandamali Dolawatta put them back in contention. They first added 70 before Galegedara retired hurt and then a further 23 until she was dismissed for 50. The pair had put Sri Lanka ahead of the required rate but both fell in quick succession, Dolawatta being dismissed for 74 to make it 194 for 6. A couple more wickets followed, the eighth falling for 211 but the ninth-wicket pair held its nerve to seal victory with four overs to spare. Stafanie Taylor reaffirmed her status as the best batsman in the tournament by making an 83 that set up West Indies for an easy victory over Pakistan. The win was West Indies' fourth and secured them second spot, while Pakistan finished fourth after losing their final three matches. Taylor completed the one-day leg with 390 runs, more than double the next highest scorer. Taylor was assisted by her captain, Merissa Aguilleira, with whom she shared a 118-run stand for the third wicket. Taylor was dismissed in the 40th over, short of her third one-day century, but she had provided the platform for the rest of the West Indies batting. They plundered 89 in the final 11 overs to leave Pakistan facing a tall target. Pakistan captain Sana Mir top scored with a patient 39 but with little support form her team-mates, her side never seriously challenged the West Indies total. They slid to 139 for 5 when Mir was dismissed, after which the remaining five wickets folded for 24 runs. Taylor prised out two wickets with her offspin to ensure she would get the Man of the Match award.